During an emergency UNSC meeting on the Crimean crisis yesterday a question was raised concerning SPEARHEAD's ability to secure the planet should there be conflict between the superpowers. The commander of SPEARHEAD U.S. Army Lieutenant General "Stomper" Santorno, said that both he and his senior flag and general officers including those from the Russian Federation "serve a higher cause than any one nation and are responsible for the planet first and our flags second". He explained that while the operating forces of SPEARHEAD are commissioned, instructed, trained and fielded by the worlds military and security forces as well as drawn from the medical and scientific community of many nations their oaths are superseded by the needs of Earth as a whole. General Santorno's sentiment was echoed by Russian Air Force Lieutenant General "Voran" Kerimov, SPEARHEAD Deputy Commander for Operations/ Deputy Chief of Staff who addressed the council as the most senior Russian Federation officer assigned to SPEARHEAD. He said that any officer or or serviceman who does not commit his life to the security of Earth would be summarily dismissed from the organisation after a short but effective course of brainwashing. While SPEARHEAD may find it easy to close ranks, the media became concerned about the joint Russian-U.S. space program. Currently a U.S. astronaut and two cosmonauts, one whom is from Crimea, are scheduled to touch down on Russian soil next Monday after months aboard the ISS. 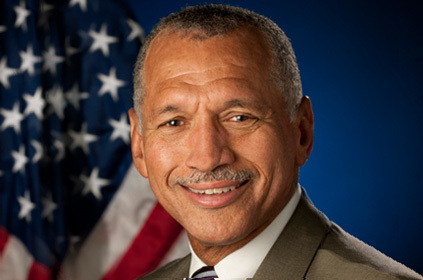 "Everything is nominal right now in our relationship with the Russians," said NASA Administrator Charles Bolden. Since the retirement of space shuttle program, the U.S. relies entirely on Russia for human transport to and from the ISS, paying $70 million for every astronaut. U.S. House of Representatives Science Committee Chairman Lamar Smith said in a statement on Tuesday that the U.S. needs to back away from the arrangement with Russia's space program and paying them to "hitch a ride to space". He wants NASA to develop it's own delivery vessel and once again lead the world into space. "Leadership in space exploration is a goal worthy of a great nation." Former astronaut Tom Jones says that NASA is intent on keeping ISS missions from becoming a political football. He points to the Apollo/Soyuz missions of the mid-70s, during the height of the Cold War, as evidence that the two countries cooperated in a spirit of detente and said the two space partners are more inter-dependent than ever now. "What they lack for example, is all the control software that we use to point, manoeuvre and control the space station," Jones says. "So, they would not be wise to deny us access, because they would be denying themselves access to all the utilities and supplies they need for the space station."